UC Berkeley is a leader in 3-D printing. From creating a prosthetic hand for an 8-year-old girl to a “smart cap” that senses spoiled food to large-scale cement buildings, engineers and designers on campus are pushing the technology to the limits, using it in ways never seen before. But Nicole Panditi, a mechanical engineering student, and Scott Silva, and environmental sciences student, have a solution. Panditi and Silva, who work for the Student Environmental Resource Center, and Ph.D. student Mickey Clemon are leading the 3-D Printer Filament Reclamation Project to decrease the amount of plastic waste made by 3-D printers on campus. They’re creating a campuswide system that takes used 3-D printer plastic, grinds it up, melts it down and produces a new spool of plastic that can be used again in the campus’s 3-D printers. 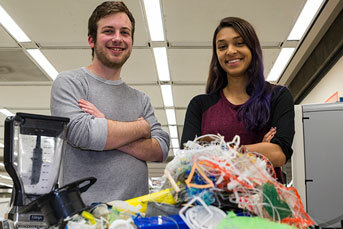 UC Berkeley students have established an initiative to collect and recycle the plastic left behind from 3-D printers on campus. Although there have been several smaller student efforts to recycle 3-D printer plastic on campus, and some campus labs buy recycled filament, this would be the first time UC Berkeley had an infrastructure to recycle all the 3-D plastic waste on campus, something Panditi says will be essential as 3-D printing becomes more and more popular. “It’s my personal goal to reduce inefficiencies in 3-D printing so that the tech industry can reach its full beneficial potential without being haunted by mountains of ugly waste,” she says. The project is spearheaded by Cal Zero Waste, which aims to decrease waste on campus and to find new, creative ways to reuse and recycle items, particularly plastics. Lin King is manager of Cal Zero Waste and adviser to the 3-D printer filament reclamation team. He says creating a closed loop of 3-D printer plastic waste on campus not only decreases the amount of plastic waste, but also lightens the carbon footprint. “The idea is that the plastics would never have to leave campus,” says King. “We would provide Berkeley-produced recycled filament and any discarded items would be sent right back to us.” Discarded 3-D prints are ground up, melted down and used to make new spools of 3-D printer plastic. Born with symbrachydactyly, Sophie doesn’t have fully developed finger bones in her left hand. But with the help of a CITRIS Invention Lab team, she is the new user of a 3-D-printed super hand. Experts aren’t the only ones using 3-D printers at UC Berkeley. Students in labs across campus, from Jacobs Hall to the Digital Fabrication Lab, can print models for their projects, quickly creating new prototypes. Even novices can now print their own projects at Moffitt Library’s Makerspace. For people new to 3-D printing, says Panditi, up to half of their projects can fail. The most popular type of plastic for 3-D printing on campus is bio-based PLA. (The plastic of choice used to be petroleum-based ABS plastic, which has since been found to release a carcinogen when it’s heated.) Although PLA is marketed as compostable, most facilities, including the facility that UC Berkeley uses — Republic Services West Contra Costa Landfill in Richmond — don’t use a long enough cycle to break down these plastics, which can take 90 to 120 days to completely decompose. After a normal 45-day cycle, the facility will sift through the compost material and pull out any plastics that remain, then throw them into a landfill. The facility says it’s in the process of changing how long plastics stay in the compost cycle, so that eventually compostable plastics will break down, but hasn’t done so yet. That’s why it’s even more crucial to find alternative ways to recycle plastics on campus, says King. The campus does not recycle PLA because there isn’t a U.S. market for it. That means it would be shipped to another country, such as China or Vietnam. The 3-D printer filament reclamation team has proven that the process works, but is missing one key piece before it can officially pilot the program on campus. Right now, the team is using a kitchen blender to break down the plastics — hardly efficient for managing the growing amount of plastic waste from 3D printers — so they’ve launched a crowdfunding effort to raise $5,000 to buy a grinder, along with machinery they will need for the pilot program.